Lightly sprinkle the watermelon wedges on both sides with the salt. Stand the watermelon wedges on their edges on a rack over a sink or pan and let them drain for half an hour. Preheat the grill to high. After the watermelon has drained, rinse each piece under cold running water. Place each piece between two folded paper towels and gently but firmly press to remove excess water. Brush the watermelon lightly on both sides with honey. 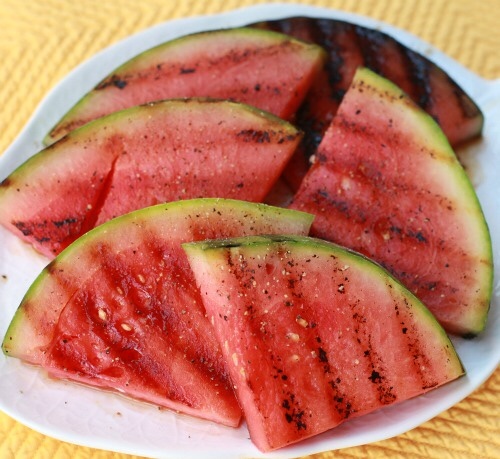 Grill over high heat until grill marks have formed and the melon is slightly softened, about 5 minutes. Remove from grill and sprinkle with sea salt and a little fresh ground pepper.